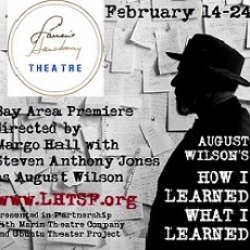 Lorraine Hansberry Theatre​ (LHT), Marin Theatre Company​​ ​​(MTC), ​​and ​Ubuntu Theater Project​ ​​have partnered on the Bay Area Premiere of August Wilson’s autobiographical and final play, ​How I Learned What I Learned​​. The touring production officially opened January 15th at Marin Theatre Company in Mill Valley and runs through February 3rd. From February 14-24, the show moves to Lorraine Hansberry Theatre at its performance venue in the Buriel Clay Theater at 762 Fulton Street in San Francisco. In March, the production travels to the Ubuntu Theater Project in the East Bay. How I Learned What I Learned​​ is brought to life by two Bay Area theater legends. Veteran actor and former LHT Artistic Director, Steven Anthony Jones embodies August Wilson in this one-man play directed by Margo Hall​​. 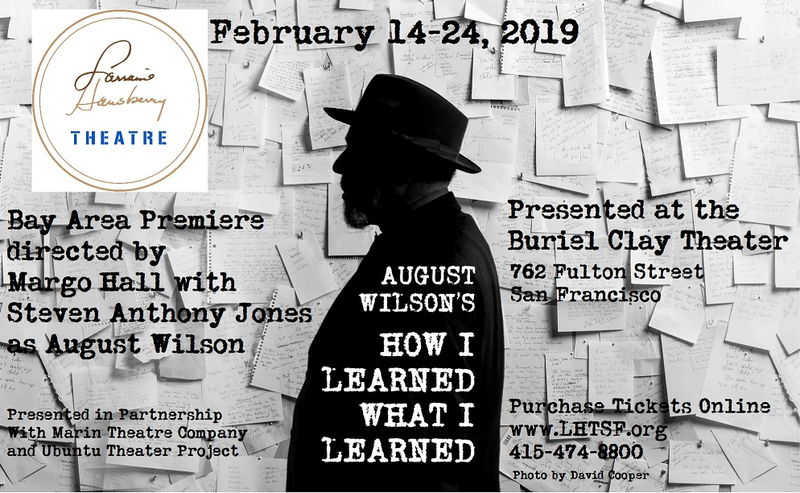 Due to the partnership of all three theatres, Wilson’s evocative and intimate memoir, charting his life-long journey of self-discovery through adversity, will engage audiences around the Bay Area at three uniquely different performance venues. August Wilson made his professional stage debut in How I Learned What I Learned in Seattle in 2003,​ just two years before his death. Directed by Co-Conceiver, Todd Kreidler, Wilson walks the audience through his life as a young black man growing up in Pittsburgh’s Hill District; a neighborhood that later serves as inspiration for his acclaimed American Century Cycle of plays. Through powerful anecdotes and lessons-learned, Wilson imparts his first encounters with love, friendship, music, racism and violence—experiences that profoundly shaped him, and his writing. 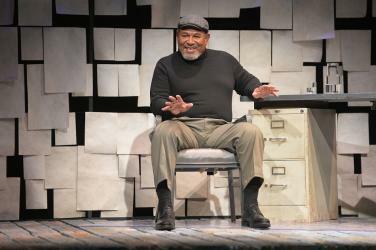 A prolific Pulitzer Prize- and Tony-winning playwright, August Wilson ​​authored ​Gem of the Ocean, ​Joe Turner’s Come and Gone​ (New York Drama Critics Circle Award), ​Ma Rainey’s Black Bottom ​ (NYDCC Award), ​The Piano Lesson ​ (Pulitzer Prize and NYDCC Award), ​Seven Guitars ​ (NYDCC Award), ​Fences ​ (Pulitzer Prize, Tony and NYDCC Awards), ​Two Trains Running ​ (NYDCC Award), ​Jitney ​ (Olivier and NYDCC Awards), ​King Hedley II ​ and ​Radio Golf. A forty-plus year veteran of stage, film and TV, actor Steven Anthony Jones ​​was the Artistic Director of the Lorraine Hansberry Theatre (LHT) from March 2011 to June 2017. During his tenure, Jones portrayed U.S. Supreme Court Justice Thurgood Marshall in LHT’s production of George Stevens, Jr.’s one-man play THURGOOD in July 2015 at the Creativity Theater and an encore production in April 2016 at the Buriel Clay Theater, also directed by Margo Hall. 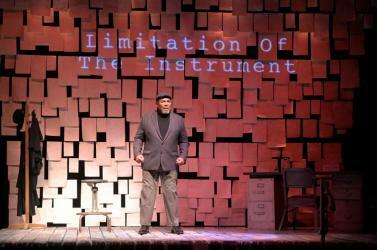 As August Wilson, Jones returns to the ​Lorraine Hansberry Theatre​​ which has produced seven of August Wilson’s ten American Century Cycle plays including: ​Fences, ​​Joe Turner’s Come And Gone, ​King Hedley II, ​The Piano Lesson, ​Ma Rainey’s Black Bottom, ​Jitney and ​Two Trains Running, since its founding in 1981. ​​ABOUT LORRAINE HANSBERRY THEATRE (LHT) |​​ Box Office: ​LHTSF.org​ ​| (​415) 474-8800 | ​Founded in San Francisco in 1981, the Lorraine Hansberry Theatre is the premiere African American theatre company in the San Francisco Bay Area. LHT has produced more than 140 plays, including west coast and world premieres, experimental works, classics in the African-American canon, lively musicals, and poignant socio-political dramas. The Lorraine Hansberry Theatre presents plays by both emerging and established African American and multicultural playwrights and provides employment and career building opportunities for actors, directors, designers, and technicians from the African American and multicultural communities. LHT draws from the cultural and economic resources of the San Francisco Bay Area to enrich and strengthen the Performing Arts by actively seeking and participating in collaboration with Bay Area arts institutions and performing arts organizations.